This approximate true-color image taken by Opportunity highlights a feature called "Karatepe" within the impact crater known as "Endurance." This is an area where NASA plans to send the rover into the crater. NASA has decided the potential science value gained by sending Opportunity into a martian impact crater likely outweighs the risk of the intrepid explorer not being able to get back out. Opportunity has been examining the rim of the stadium-sized "Endurance Crater" since late May. The rover team used observations of the depression to evaluate potential science benefits of entering the crater and the traversability of its inner slopes. The soonest Opportunity could enter Endurance is early next week. It will drive to the top of a prospective entry-and-exit route on the southern edge of the crater and make a final check of the slope. If the route is no steeper than what recent testing runs at NASA's Jet Propulsion Laboratory, Pasadena, Calif., suggest a rover can climb, controllers plan to radio Opportunity the command to go into the crater. "This is a crucial and careful decision for the Mars Exploration Rovers' extended mission," said Dr. Edward Weiler, NASA's associate administrator for space science. "Layered rock exposures inside Endurance Crater may add significantly to the story of a watery past environment that Opportunity has already begun telling us. The analysis just completed by the rover team shows likelihood that Opportunity will be able to drive to a diagnostic rock exposure, examine it, and then drive out of the crater. However, there's no guarantee of getting out again, so we also considered what science opportunities outside the crater would be forfeited if the rover spends its remaining operational life inside the crater." 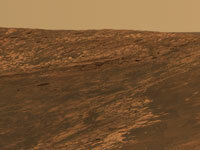 Opportunity and its twin, Spirit, successfully completed their primary three-month missions on Mars in April. At a rock outcrop in a small impact feature nicknamed, "Eagle Crater," where Opportunity first landed, the rover found small-scale rock textures and evaporite mineral compositions testifying that a body of salty water covered the site long ago. The wet environment may have been a suitable habitat for life, if it ever existed on Mars. However, only the uppermost layer of the region's layered crust was exposed at Eagle Crater, not deeper layers that could reveal what the environment was like earlier. The rock layer seen at Eagle Crater appears at Endurance Crater, too. 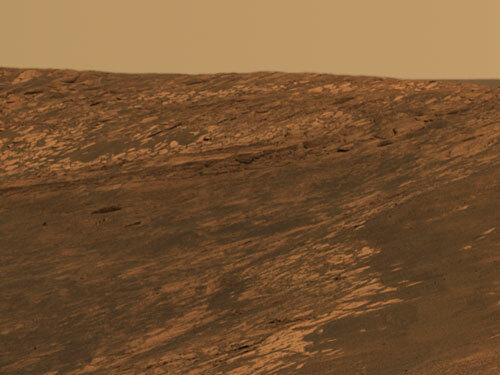 At Endurance, though, it lies above exposures of thicker, older layers, which are the main scientific temptation for sending Opportunity inside the crater. "Answering the question of what came before the evaporites is the most significant scientific issue we can address with Opportunity at this time," said Dr. Steve Squyres of Cornell University, Ithaca, N.Y., principal investigator for the science instruments on both rovers. "We've read the last chapter, the record of the final gasps of an evaporating body of water. What came before? It could have been a deep-water environment. It could have been sand dunes. It could have been a volcano. Whatever we learn about that earlier period will help us interpret the upper layer's evidence for a wet environment and understand how the environment changed." Richard Cook, project manager at JPL for the rovers, said that reaching one exposure of the older rock layers inside Endurance requires driving only about 5 to 7 meters (16 to 23 feet) into the 130-meter-diameter (140-yard-diameter) crater. The rover is on the rim at that site, which had been dubbed "Karatepe." "We'll take an incremental approach, edging our way down to the target," Cook said. The plan is to use the tools on Opportunity's robotic arm to analyze the exposed layers for several days, then drive in reverse back up the slope and exit the crater. The slope between the rim and the layered outcrop at Karatepe is about 25 degrees. "We have done testing that says we can do 25 degrees, provided the wheels are on a rock surface and not loose sand," Cook said. Engineers and scientists on the rover team built a test surface mimicking the rocks and sand seen in Opportunity's images of Endurance Crater. The surface was tilted to 25 degrees, and a test rover climbed it. If portions of the route to the outcrop turn out to be between 25 and 30 degrees, the team plans to proceed slowly and use Opportunity to assess the amount of traction the rover is getting.